After several visits to Parliament the Lokpal Bill is once again before the nation's legislators. Pradeep K Baisakh traces the lineage and condition of the legislation that could curb corruption in public offices. The government is once again attempting to kill the office of the Lokpal before it is born, this time by various delaying tactics. The Law Minister has very recently referred the existing Lokpal Bill (which was presented before Parliament in 2001, but lapsed due to the dissolution of the 13th Lok Sabha) to a Group of Ministers. This GoM supposed to suggest improvements to make the bill comprehensive by bringing all the three wings of the state - the Legislature, the Executive and the Judiciary - under the purview of the Lokpal. This delay is frustrating to citizens hoping for some independent authority for the redressal of their grievances against the various arms of government. The Indian Lokpal is synonymous to the institution of Ombudsman existing in the Scandinavian countries. The office of the ombudsman originated in Sweden in 1809 A.D., and adopted eventually by many nations 'as a bulwark of democratic government against the tyranny of officialdom'. Ombudsman is a Swedish word that stands for "an officer appointed by the legislature to handle complaints against administrative and judicial action. Traditionally the ombudsman is appointed based on unanimity among all political parties supporting the proposal. The incumbent, though appointed by the legislature, is an independent functionary - independent of all the three organs of the state, but reports to the legislature. The Ombudsman can act both on the basis of complaints made by citizens, or suo moto. S/he can look into allegations of corruption as well as mal-administration. In the regular dispensation of government there are implicit and explicit ways that citizens can voice their grievances and demand change. But these are often difficult. Within administrative departments, for example, any decision of one official can be appealed to a higher official, all the way up to the head of a department. However, this mechanism has inherent flaws. Higher officers enjoy departmental fraternity with those against whom complaints are made, and both sail the same boat. Therefore their impartiality in judging appeals is always doubted. On the legislative side, an individual can approach the member representing his constituency for his demands. But given the absence of easy access of an ordinary citizen to his representative, this has more remained a myth more than reality. Among the organs of state, the Judiciary has proved itself to have highest credibility in protecting individual rights. However, due to procedural complexities involved in court cases - right from filing a case to the delivery of final verdict - there are inevitable delays of justice, which often are also denial of justice. Examples from various countries suggest that the institution of ombudsman has very successfully fought against corruption and unscrupulous administrative decisions by public servants. The existing devices for checks on elected and administrative officials have not been effective, as the growing instances of corruption cases suggest. The Central Vigilance Commission (CVC) is designed to inquire into allegations of corruption by administrative officials only. The CBI, the premier investigating agency of the country, functions under the supervision of the Ministry of Personnel, Public grievances and Pensions (under the Prime Minister) and is therefore not immune from political pressures during investigation. Indeed, the lack of independence and professionalism of CBI has been castigated by the Supreme Court often in recent times. All these have necessitated the creation of Lokpal with its own investigating team in earliest possible occasion. Therefore, there is a need for a mechanism that would adopt very simple, independent, speedy and cheaper means of delivering justice by redressing the grievances of the people. Examples from various countries suggest that the institution of ombudsman has very successfully fought against corruption and unscrupulous administrative decisions by public servants, and acted as a real guardian of democracy and civil rights. The functionary is called by different names in different countries; its power and functions also vary. In the Scandinavian countries (Sweden, Denmark, Finland, Norway) he is called the 'Ombudsman'. He can take cognizance of the citizens' grievance by either directly receiving complaints from the public or suo moto on the basis of information provided by the interested persons, or from newspapers, etc. However, in the U.K. the functionary - known as the Parliamentary Commissioner - can receive complains only through members of parliament. The ombudsmen can investigate a complaint by themselves or through any public or private agency. After investigation, in Sweden and Finland, the Ombudsman has the power to prosecute erring public servants; whereas in Denmark, he can only order prosecution. However, the power of prosecution is very rarely used. The strength of the ombudsman lies in the publicity attached to the office, and the negative view that attaches itself to all that the office scrutinises. In Sweden and Finland, ombudsmen can also supervise the courts. In other countries, their authority is only over the non-judicial public servants. In almost all the cases they deal with complaints relating to both corruption and mal-administration. In early 1960s, mounting corruption in public administration set the winds blowing in favour of an Ombudsman in India too. The Administrative Reforms Commission (ARC) set up in 1966 recommended the constitution of a two-tier machinery - of a Lokpal at the Centre, and Lokayukt(a)s in the states. The ARC while recommending the constitution of Lokpal was convinced that such an institution was justified not only for removing the sense of injustice from the minds of adversely affected citizens but also necessary to instill public confidence in the efficiency of administrative machinery. Following this, the Lokpal Bill was for the first time presented during the fourth Lok Sabha in 1968, and was passed there in 1969. However, while it was pending in the Rajya Sabha, the Lok Sabha was dissolved, resulting the first death of the bill. The bill was revived in 1971, 1977, 1985, 1989, 1996, 1998 and most recently in 2001. Each time, after the bill was introduced to the house, it was referred to some committee for improvements - a joint committee of parliament, or a departmental standing committee of the Home Ministry - and before the government could take a final stand on the issue the house was dissolved. The Lokpal was visualized as the watchdog institution on ministerial probity. Broadly the provisions of different bills empowered the Lokpal to investigate corruption cases against political persons at the Central level. Some important features of the Lokpal Bill have varied over the years; in its most recent avatar, the bill contains the following. Objective is to provide speedy, cheaper from of justice to people. Members: Lokpal is to be a three member body with a chairperson who is or has been a chief justice or judge of the Supreme Court; and its two other members who are or have been judges or chief justices of high courts around the country. Appointment : The chairperson and members shall be appointed by the President by warrant under his hand and seal on the recommendation of a committee consisting of the following persons. It's not clear whether the committee has to make a unanimous decision or a majority decision will do. (a)	The Vice-President (Chairman) (b)	The PM (c)	The Speaker of LS (d)	Home Minister (e)	Leader of the House, other than the house in which PM is a member. (f)	Leaders of Opposition of both the houses. Independence of the Office: In order to ensure the independence of functioning of the august office, the following provisions have been incorporated. Appointment is to be made on the recommendation of a committee. The Lokpal is ineligible to hold any office of profit under Government of India or of any state, or similar such posts after retirement. Fixed tenure of three years and can be removed only on the ground of proven misbehaviour or incapacity after an inquiry made by CJI and two senior most judges of SC. Lokpal will have its own administrative machinery for conducting investigations. Salary of Lokpal is to be charged on the Consolidated Fund of India. The central level political functionaries like the Council of Ministers including the Prime Minister, the Members of Parliament etc. He can not inquire into any allegation against the PM in relation to latter's functions of national security and public order. Complaints of offence committed within 10 years from the date of complaint can be taken up for investigation, not beyond this period. Any person other than a public servant can make a complaint. The Lokpal is supposed to complete the inquiry within a period of six months. The Lokpal has the power of a civil court to summon any person or authority. After investigation, the ombudsman can only recommend actions to be taken by the competent authority. A number of safeguards have been taken to discourage false complains or complain of malafide intent. He can order search and seizure operations. He shall present annually to the President the reports of investigation and the latter with the action take report has to put it before the both houses of parliament. It may be noted that the Lokpal is supposed to investigate cases of corruption only, and not address himself to redressing grievances in respect of injustices and hardship caused by maladministration. The misdeeds committed during the Emergency remind us of the necessity of including the PM within the purview of the Lokpal. Very recently a highly discouraging phenomenon has come to light, that is, the prevalence of corruption in the subordinate courts and even in High Courts. Probably due to this, the present government has planned to bring the Judiciary within the purview of Lokpal; this is one reason why the Bill has been referred to the Group of Ministers. However given the history of Lokpal bill, there is a constant risk that the bill will simply lapse because no conclusion is reached within the life of this Lok Sabha! 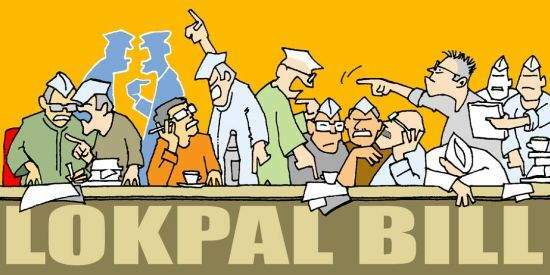 The political fraternity is understandably opposed to a Lokpal, since the purported target of the Lokpal is mainly the politicians themselves. "Be you ever so high, the law is higher than you". According to this maxim of the supremacy of the law, there is no reason why the PM should be given special treatment over other functionaries. The misdeeds committed during the Emergency remind us of the necessity of including the PM within the purview of the Lokpal. The Prime Minister is the example-setter for political life; the inclusion of his office strengthens the cause of probity in public life, whereas his exclusion would create suspicion in the public's mind about the honesty and integrity of the highest political executive of the country. It appears likely that the revised bill will include the Prime Minister within the Lokpal's purview, with proper safeguards that would exclude any possibility of conspiracy to scandalise the PM. Whether the Lokpal should have its own investigation machinery, or if it should depend on the existing ones. The principal reason for growing corruption in public life, despite the existence of stringent laws, is the inability, as well as the lack of commitment and impartiality, of the investigating agencies. The agencies have not shown the desired degree of honesty, and instead been pliant to their political masters. Making the Lokpal solely dependent on the existing investigating bodies would amount to empowering the office of Lokpal in theory, but making it pointless in practice. There is also the question of costs incurred, should a separate investigative machinery for the Lokpal be established. But this is simply a distraction. Not only would the costs be miniscule in comparison to many other initiatives, but they would likely be compensated by reduced corruption in administrative and legislative matters that impart a huge cost when unchecked. There are as many as 17 states where the institution of Lokayukta has been constituted, beginning with Orissa in 1971. However the power, function and jurisdiction of Lokayuktas are not uniform in the country. In some states it has been applicable to all the elected representatives including the CM. In some other states legislators have been deliberately kept out of his purview. Often, lacunae have been left in legislation creating the office, apparently to keep the elected representatives outside meaningful jurisdiction of the Lokayukta, even when the laws appear to include them. Lokayuktas have not been provided with their independent investigative machinery making them dependent on the government agencies, which leaves enough scope for the politicians and the bureaucrats to tinker with the processes of investigation. Despite provisions that have rendered the Lokayuktas toothless, competent office-holders have tried to use the office for the public good. In Karnataka, especially, the Lokayukta, despite small budgets and limited authority, has emerged as a figure of some respect, visiting government offices regularly and proactively exmaining corrupt practices. Here too, however, MLAs remain beyond his jurisdiction. Pradeep K Baisakh is a freelance journalist.